Hey there, Geoff here! It’s been a while! The temperature is rising rapidly in paradise and summer is looming. I use the word ‘looming’ reluctantly because I love the summer…just not the soaring temperatures and sweat-inducing humidity. We don’t have air-conditioning in our humble abode so during the day it becomes unbearable! 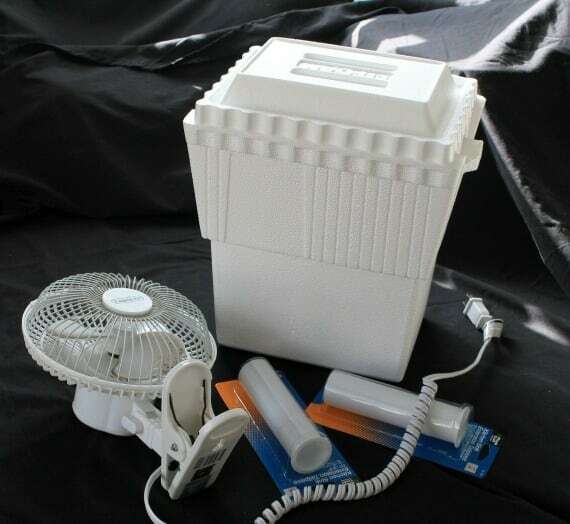 Checking online for something that might help brought up a few designs for a do-it-yourself air conditioner so I thought I’d throw my hat in the ring with a budget “Awesome-on-20” AC unit! First off, you’ll need something that keeps the cold in and the heat out. I chose a cheap $2.99 polystyrene cooler from Safeway. Secondly, you’ll need a cheap fan, preferably one that’s been lying around at home for a while. Thirdly, you’ll need some ice…It’s that simple! Take your cooler and cut a hole in the lid. 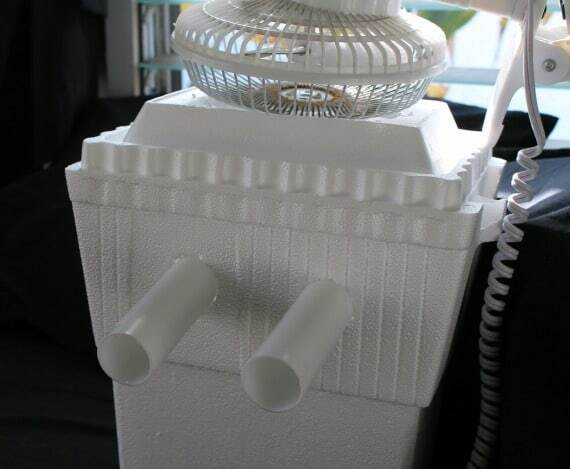 Make sure that the hole isn’t bigger than your fan but big enough that most (if not all) of the fan’s power can be directed down into the cooler. Next, you’ll need somewhere for the air to come out again. For this, you just need to cut two holes in the side of the cooler. The two plastic pipes ($2 from a hardware store) I added are optional. These will give you more control of the air direction. Remember, the smaller the holes, the faster the air will blow through them and the more breeze you will get. 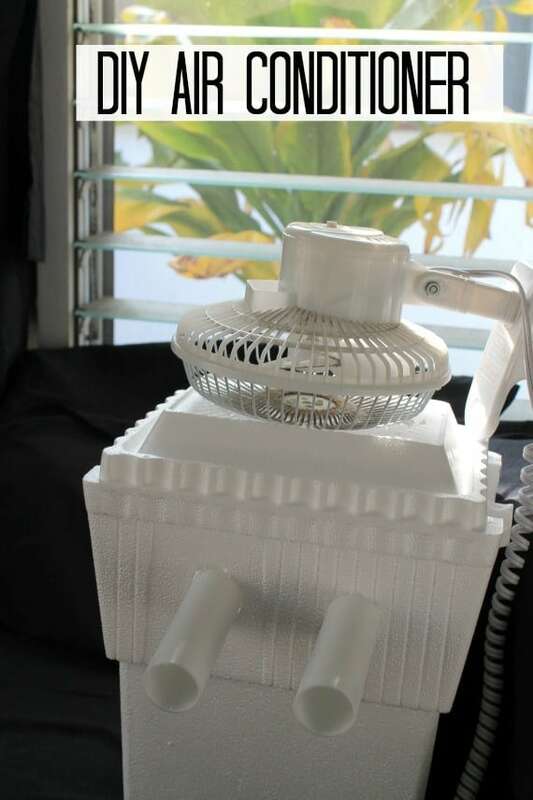 Add in some ice, plug in the fan and away you go. We filled a gallon milk carton with water and left it in the freezer overnight. Although any and all ice should work for you! I’m not going to say that this is the best AC unit ever. . . it’s not. . . but if you want something to sit on the desk next to you while you are writing the next chapter of your novel and drinking Pimms and lemonade…you’ve got a winner. I have seen something similar to this and I am fascinated. The one I saw had you add frozen gallon of water into the cooler. Yes, it needs ice for sure. We use a gallon milk jug filled with water and frozen over night. You can use whatever empty container you have lying around. Keeps some plastic out of the landfill for a little while, too. Wait I actually need this. It’s like 1000 degrees in New York and even though I have an A/C in the living room it doesn’t always hit the bedroom. Thank you for sharing! Put this on your night stand with a big container of ice inside and you’ll sleep like a chilly baby. I am super intrigued! I definitely need to try this out this summer. Thanks for this cool (pun intended) life hack! Stopping by from SITS on Facebook. Great idea! We would love to feature this idea on our site as a guest feature. Let me know if we can share your idea with our readers! Thanks!